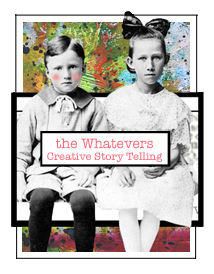 If you missed the what the Whatevers is all about…check it out here. Yes, he was annoyed. Just because he was German he wasn’t stupid. He would build the biggest barrel filled with beer and they’d like him. The coppery color is wonderful! I like how you added to the canvas lettering. But, my favorite thing is your take on the photo and your awesome sense of humor! Cracking up!! ahahhahah FUNNY! I love this … I LOVE the orange in this! “Who’s laughing now.. take that!” lol… you crack me up!! !